I love to shop online. Yes, I know that I live within walking distance to some of the finest shopping in the United States, including the flagship Nordstrom’s in Seattle, but that would mean venturing out of my house. Making myself pretty enough for public consumption. Clothes, makeup… do I have to? I’ve discovered something that has rocked my world: RetailMeNot.com. Do you know about this site? Before I click the “complete purchase” button on any website, I swing over to RetailMeNot.com and type in the business to see if there are any promo codes for that site. Like right now, as I write this, I can get $20 off a pair of jeans from Amazon.com. Or hey, I can get free shipping on any pair of shoes I buy from Nordstrom.com. No need to walk to the store when the shoes can come to me for free. The best way to use RetailMeNot, I’ve found, is to wait until I’m ready to check out at whatever site I’m shopping, then check to see if there’s a promo code for anything that’s in your shopping cart. That way, it’s like coming into free money. You were going to buy the items anyway, so any savings you might get will be a happy surprise. If I don’t find a promo code on RetailMeNot, I sometimes Google the store name and the words “promo code.” I’ve had less success that way because there are a lot of promo codes out there that have expired. Things stay on the internet forever, but they aren’t effective forever, and it gets frustrating to try several promo codes that don’t work. Try RetailMeNot. You’ll thank me later. I do truly understand that readers’ entertainment funds are limited, and I’m always honored that you choose to buy my books. ALREADY HOME is the first book of mine that my publisher has released in trade paperback format, which costs more than mass market paperbacks. So I’ve created a page on my website to tell you when a reader lets me know about a great price on ALREADY HOME. 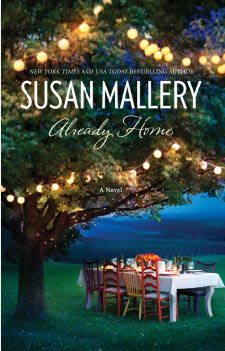 The link to the page is in the Bargain box on the right-hand side of my home page, www.SusanMallery.com. There are a few bargains out there already. Be sure to let me know if you find more! Besides bookstores, what is your favorite site for online shopping? What do you love about it? What is the most recent thing you bought online? Good Choice Reading is giving away a copy of Already Home to one lucky person. However, we do have a donate button on the left if anyone would like to help out, we can make it international. Check out Sinfully Tasty Reads (Ours Adult Romance Blog) for another chance at winning Already Home. You can only win once though. I shop all the time on Amazon (yes, I usually still buy books but sometimes I buy other stuff too :)!). I utilize Swagbucks.com too so I save up to get Amazon giftcards. I use amazon all the time. I just ordered some cheese from them this morning. I shop at iHerb.com.I am a vitamin nut and their prices are the best. I can find ANYTHING there! Latest: Cooking with coconut oil. I love Amazon, too, and for more than just the books! I love that you can buy just about anything on there. Too much fun! It's pretty fun to look through the really big ticket items there sometimes. Things that are wayyyyyy too expensive to actually buy, but just so much fun to drool over. Soft Fuzzy Sweater - okay, it sounds really weird to call you that. LOL I've heard that coconut oil is the most delicious oil to use when making popcorn. Try it and let me know what you think! Besides Amazon for almost everything - especially books - I shop at ohmycrafts.com for the best scrapbook, craft supplies, and Cricut deals. After reading scrapbooking is my next obsession. I love Powells for used books and BN.cpm for others since with membership there is free shipping. I would love to read this book. THank you! X-treme Reader, ooooh, how fun! I think I could get into scrapbooking, if I could just find the time. It looks really fun. Thank you for stopping by, Teril! I hope you love ALREADY HOME! I just realized that I haven't thanked Damaris... BAD ME!!! Not only was Damaris kind enough to host me here today at Good Choice Reading, but she also coordinated this entire blog tour. Thank you so much, Damaris! You definitely earned the title of Head Cheerleader. ;) I really appreciate everything you've done for me. Can't wait to meet you at BEA! I use Walmart.com because they have the site to store with free shipping! I bought a new camera and my sony ereader last time and both were a bundle so it was a good deal!! Can't wait to read this book!!! Lately I've been shopping on Barns and noble , buying used books from their "trusted sellers". I purchased 12 books! Love reading. The last book I bought was Hush Hush. I love Amazon. They have everything. I purchased City of Fallen Angels by Cassandra Clare and pre-ordered the new Harry Potter. Hubby and I love BuyDig.com. We bought our big-screen TV and digital camera from that site. Free Shipping is the draw. Oooooh, Tiffany! eBay is dangerous! Bidding can get out of hand. I've bought my husband some great presents on eBay, though. He loves art glass, and you can find anything on eBay. Vivien, another eBay addict!!!! What did you buy most recently? Anything fun? Tanya... What's that now?! A new Harry Potter?! Heidi, have you read Hush Hush yet? Do you love it? Sounds really intriguing! Mona, I've never heard of BuyDig.com. I'm going to go check it out tonight! Thanks for the recommendation! Thank you, Tore! I hope you love ALREADY HOME. It's gotta be Amazon! Especially their section on Bargain books..Way too addicting!! smashwords.com, booksonboard.com, bn.com and amazon.com. Yes, I shop around for bargains and deals. Oh, I'm such a bargain hunter. I love Amazon, they really do have just about everything you need. I ordered some tea from them that I had found locally and then couldn't find it anymore. Also, they have a lot of sugar-free syrups and as I have to watch my blood sugar they come in handy for coffee and soft drinks. I use Origins makeup and face creams, etc. I probably place an order from there about every 2 months. But, I did just place an order from ABT for a new iphone case. I wanted a SkullCandy one and neither our local Apple store and bestbuy carried one for the iphone. I had a great experience buying form ABT. Same price that I expected and no cost for shipping and no sales tax. When I shop online it is almost always at Amazon. They have great prices and so many things that you can find. A lot of Amazonians here! Molly, I love the skull candy phone case! Cute, cute, cute. They have such neat things. I'll have to check out ABT. My favorite site for online shopping is Amazon.com because I can find almost anything I'm looking for, the prices are competitive, and free shipping is often available :) The most recent thing I bought online was a Club Pogo membership. *Thanks* for the giveaway! My Favorite site for Books is Amazon, and for medicines and health products is Drugstore. Both have been so helpful and so easy. Amazon. They really have a great recommendation system based on what you have already read or bought. And the most recent was a book. I order from an independent online bookseller called ebookisle.net, as well as, Amazon. EBay!! I love that you can find almost anything you are looking for. My last purchase was a cross-stitch pattern of the Monopoly board. I would have to say I am an EBAYaholic! I also like Overstock.com selection is my reason why and the last thing I bought was.....an outdoor rug. YEAH! Spring is here! I like Amazon. The most recent thing I bought online were two kindles...one for each of my daughters. I shop at Amazon and the last thing I bought was a knitting book. Just got it yesterday! I love amazon and mostly just do book shopping online with some kids stuff thrown in. I like amazon because I can get books and other things all at once. If I don't do amazon I shop at walmart.com for my kids and nieces and nephews who live in a different state for christmas and birthdays. That way I can go the site to store option and not worry about shipping. We live in a very little town and our walmart isn't stocked very well so it's nice to have that site to store option. My fav. thing I bought online.... It was a special ordered Christmas onament I had made specially for my husband. Back home I went to the christmas bazarr every year and always bought an ornament from this lady. I loved the ornaments and over the last 5 years since we moved away I missed getting our yearly ornament, so when I saw she started her shop online, I freaked and got ahold of her and she made a special one for us.